Web design company Artonic wins award for prototype. At Artonic, we value the planning process. Michigan web design and Internet marketing company, Artonic, located in Tecumseh, MI recently won Honorable Mention for the ProtoShare Challenge, a prototyping competition, on August 30, 2013. Interactive prototypes were judged on design quality, user experience, completeness, and overall effectiveness. As an Honorable Mention winner, Artonic received $250 for its interactive prototype of a commercial website. Local entrepreneur, Matt Harper, founded Artonic in 2005. Since that time, Artonic has grown into a full-service Internet marketing and web design company, employing graphic designers, Internet marketers, account executives, and web developers. 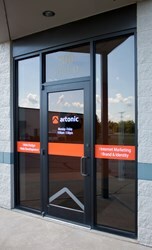 Artonic is one of the leading Internet marketing and web design companies in Michigan.